Walt Disney Pictures “McFarland” will film in Central California. Walt Disney Pictures in association with Mayhem Pictures are set to begin shooting the major motion picture “McFarland” in the San Joaquin Valley, California area beginning January, 2012. The casting director is seeking athletic Hispanic men ages 17 to 23 with running experience to recreate an authentic realism of McFarland High Cougars’s 1990’s cross-country team, who became unlikely 9-time California champions. 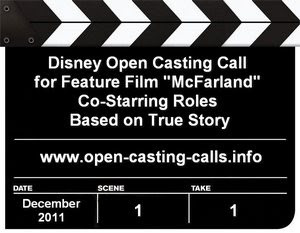 An open casting call is scheduled in Bakersfield, CA on December 17, 2011. Mayhem Pictures’ Mark Ciardi and Gordon Gray are producing “McFarland”. Ciardi and Gray previously produced three Disney sports drama feature films – “Miracle,” “Invincible,” and “Secretariat”. They also produced the Walt Disney Pictures films “The Game Plan,” “The Rookie,” and the upcoming “Wish List”. The sports film productions by Mayham Pictures is in part due to the fact that Mark Ciardi is a former Major League Baseball pitcher. He played one major league season for the Milwaukee Brewers in 1987. 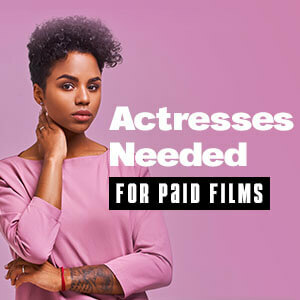 You DO NOT need to have any previous acting experience, and you DO NOT need to be signed with a talent agent to attend the casting call or be hired as an actor in this film. Please bring a pen and be prepared to fill out a form with your physical stats, running experience, and all contact information including phone number. The casting director has asked that you DO NOT talk on cell phones at the open casting call.